I took this from our balcony Saturday night around 11. This was taken over a 15 minute period. I used a torch to light up the garden in the foreground. Most of the lightning was “sheet” lightning – the whole sky was lighting up. At this stage the main storm appeared to be over Bridgetown ( by looking at the weather radar!). You can see a couple of lightning strikes low in the sky though. You can also see the lights of Busselton, Capel, and Peppermint Grove Beach. These are the red lights on the horizon, low in the image (to the left of the lightning strikes. Busselton is the rightmost patch of red lights. The 3 red vertical dots are the ABC transmitting mast at Siesta Park. 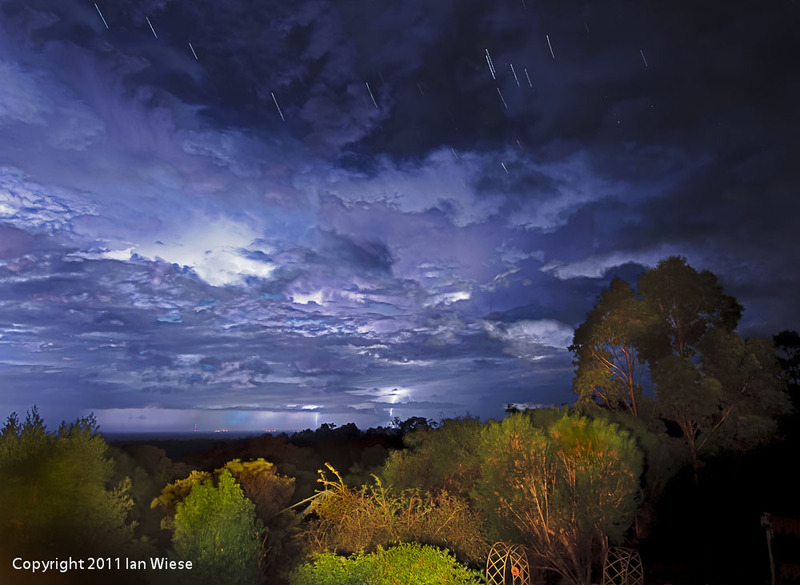 This entry was posted on April 25, 2011 by ianwiese. It was filed under Landscape and was tagged with Geographe Bay, lightning, night.